Haleem probably is the only dish for which I prefer the Hyderabadi version over the Kolkata version. Rich, thick, mushy, well-blended, Haleem is one of its kind for sure! I still remember for the first time having it during Ramzan month in a college in Kolkata. The Muslim students were distributing the Haleem and I had my first taste of it. The Kolkata version, however, is not much to my liking. If you have had both Kolkata Haleem and Hyderabadi Haleem, you must understand the difference. Here I must mention one thing. Haleem has never been a regular during the month of Ramzan at my in-law’s according to Mehebub. In fact, they eat light during the month (be it Sehri, be it Iftaar) unless somebody is invited for Iftaar. I have seen my mother in law storing several bottles of Water in her refrigerator which people collect in the evening. It is a village in West Bengal and not everybody is having a Fridge there. Call it a perk of being married to a person with different religious faith, I have seen the best of the things in my life, both at my native place, the Hindu part as well as at his, the Muslim part. I for the first-time had Hyderabadi Haleem from Pishta House, a joint enormously famous for their Haleem in Hyderabad. This then followed by ordering Haleem through Gati Konnect every year which I started from 2013 when I was in Gurgaon. Haleem calls for slow cooking. Traditionally it takes more than 8 hours of slow cooking. More the slow cooking, more you get the perfect texture of Haleem. I, though, don’t cook it for 8 hours given I use a Pressure cooker to fast the process a bit. Even then my version also calls for around 3 hours of cooking. You may, however, cut the cooking time, if you are out of time but it is worth giving that much of time! A famous Iftaar delicacy, Haleem has its origin in the Middle East as well as in the Indian subcontinent. Mussy in texture and loaded with Ghee, Haleem is a rich street food available in the markets. It is a thick soup-like dish cooked with meat, pulses, and Ghee along with the spices. Haleeequallyqally popular in India, Pakistan, and Bangladesh. The dish is derived from the Arabian dish Harees which means mash and is prepared with Meat and Lentil. Al Harees is being mentioned in a 10th-century cookbook called Kitab Al Tabikh. 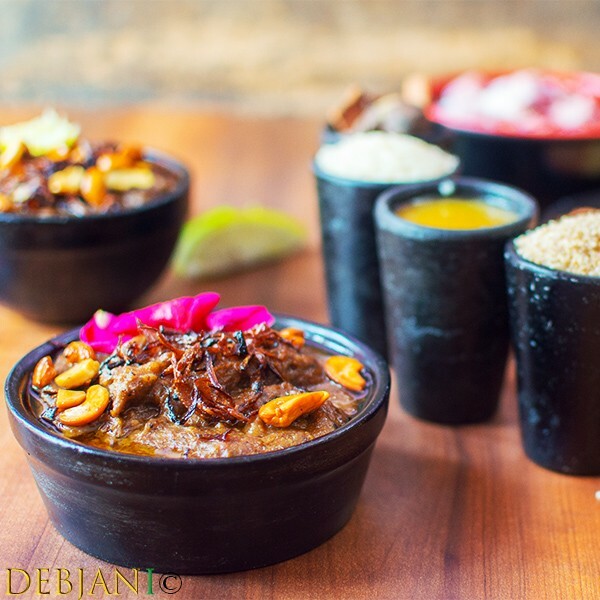 It has been said Haleem was being enjoyed by Prophet Muhammad himself! Hyderabadi Haleem or Kolkata Haleem! In India, both Hyderabad and Kolkata are famous for the Haleem. Hyderabadi Haleem is a wholesome meal cooked with Wheat, Rice (or at times Barley), lentils and meat. It is thick and rich if compared to Kolkata’s Haleem. Kolkata Haleem is a dose of comfort while the Hyderabadi Haleem is the rich royal. 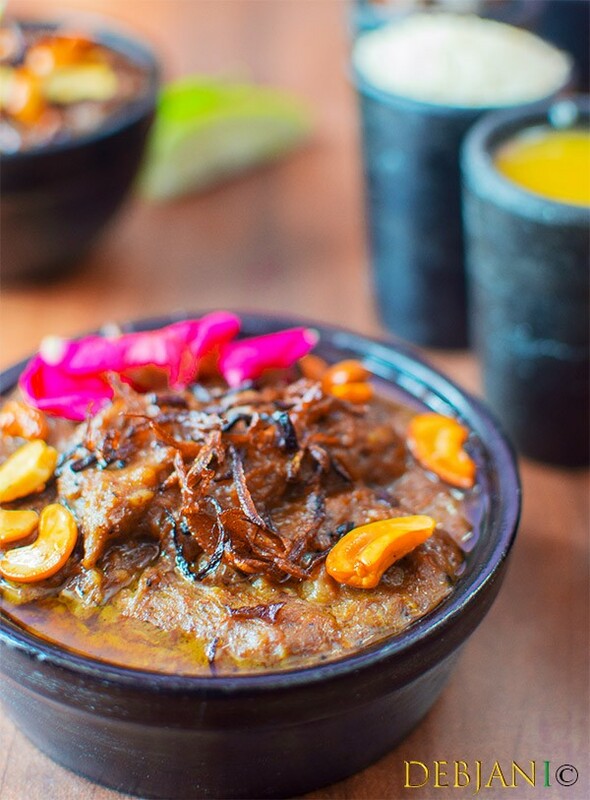 Haleem is a favored dish by the Muslim clan after breaking the fast. I must mention, this dish is equally loved by the people from other castes. Haleem probably after Biryani is the most accepted and loved Mughlai delicacy. Some of the famous joints selling Haleem in Hyderabad are Pista House, Hotel Shadab, Shah Ghouse Cafe & Restaurant, Charminar, Paradise Food Court etc. In Kolkata, best of the Lot are New Alia, Arsalan, Shiraz etc. You may read this post of mine on the Ramzan special street food available in Kolkata for further details. My Husband is Muslim by religion. We though are almost secular (I am a Hindu) however, we celebrate all the religious programmes as we respect each other’s faith and other religious faiths as well. I do cook Haleem at home, at least once or twice during the Ramadan Month. Needless to say, I cook the Hyderabadi Haleem. I mostly opt for the Mutton Haleem. It took me years to come up with a recipe that is close to the Haleem we get in Hyderabad. Coming to the recipe, it calls for loads of Ghee apart from Lentil, Wheat, and meat. Again, You can skip ghee completely or can make a less-calorie version! However, I don’t! Haleem is a meal in itself. Muslim People mostly eat it after breaking the of the Fast of Ramadan in the evening when their body calls for the good calories. 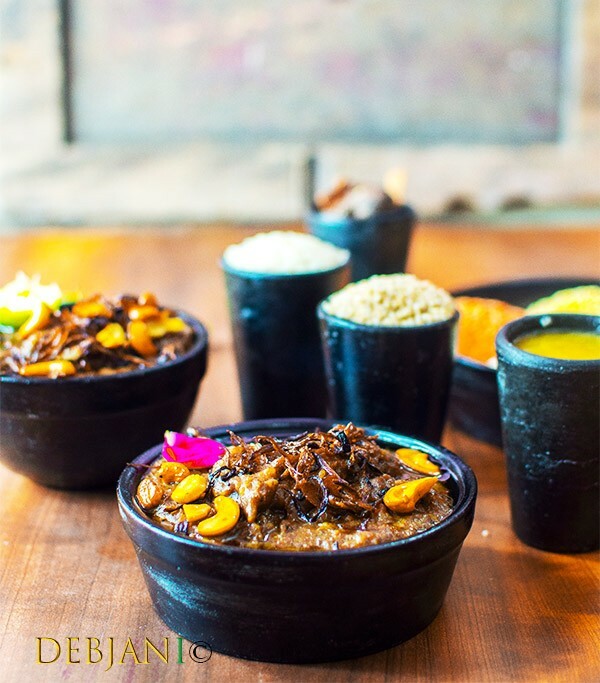 With Meat, Lentil, Wheat, and Ghee, Haleem is an amazing dish with proper nutritional balance. 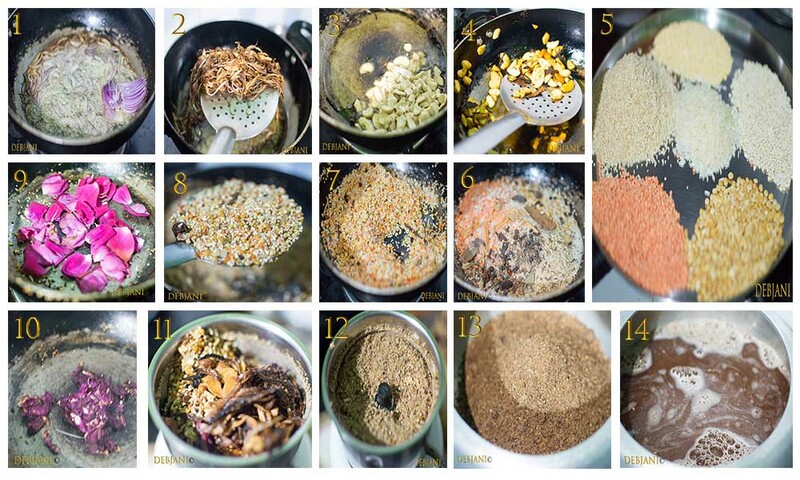 The Lentils I use are Red Lentil, Yellow Split Lentil, Pigeon Peas, and Black gram without skin. This varies from person to person. Rice is optional, however, a very important ingredient. It provides starch to the dish which is important for the texture. Barley is also used, however, I am allergic to Barley, hence I skip it. If you plan to use Barley, reduce the rice by 2 Tbsp. from the below recipe and replace that with Barley. Dry roasted Rose petals give the dish amazing aroma. Needless to say, you can substitute it with dried rose-petal or a few drops of rose-water. A famous Iftar delicacy, Haleem has its origin in the Middle East as well as in the Indian subcontinent. 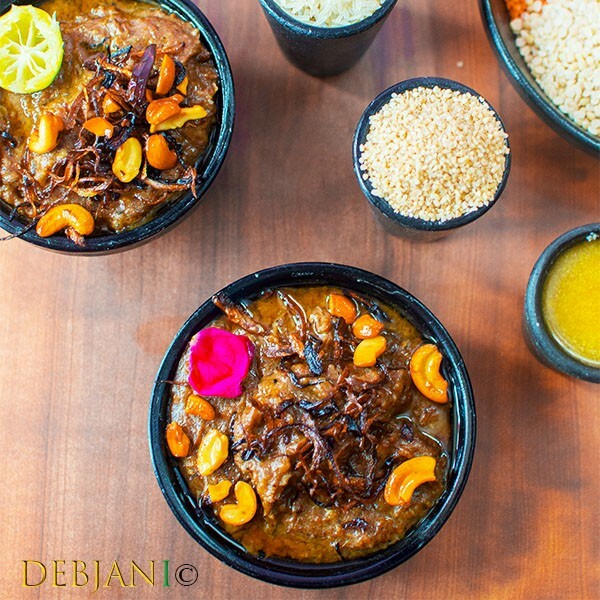 Hyderabadi Haleem is a wholesome meal prepared with Wheat, Rice (or at times Barley), lentils and meat. Take 1 Tbsp. 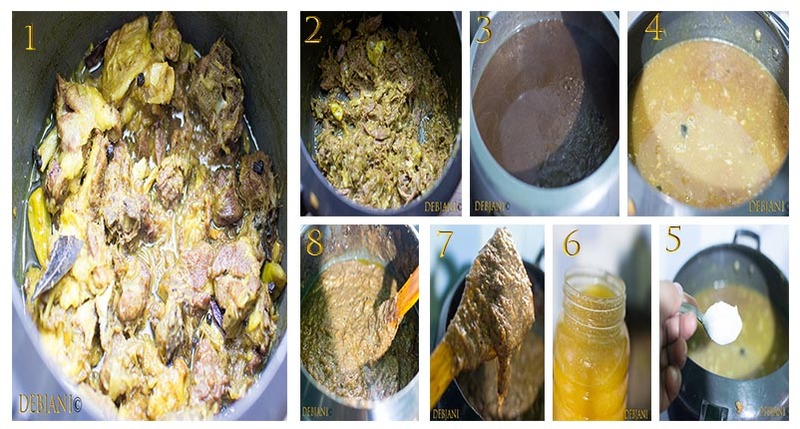 of Ghee in a PRessure cooker and heat it properly. Temper the Ghee Cinnamon Stick, Black Cardamom, Green Cardamom, Clove, Kebab Chini, and Mace. Add sliced onion and fry till those turn translucent. Now add ginger and garlic paste and cook till oil leaves from the side of the mixture. Add Mutton chunks and mix thoroughly. Add ½ Tsp. of salt and slit Green Chilies. Now add 2 Cups of Hot water and cover the cooker with the lid with the weight on. Cook on low flame until 7 whistles come out from the Pressure cooker. Open the Cooker once the pressure drops completely. Separate the bones from the mutton and mash the mutton slightly using a spatula. Heat the oil in a Pan and deep fry the onions and keep aside. Use the same oil and fry the Cashew nuts till those turn browning in color. Dry roast the Rose petals and keep those aside. Take 1 tsp. ghee in a pan and heat it. Temper the Ghee with Cinnamon Stick, Black Cardamom, Green Cardamom, Clove, Kebab Chini, and Mace. Add all the pulses (Wheat, Rice, and lentils) until those emits a nutty aroma. Switch off the flame and leave the pulses until cooled down completely. Take the mixture along with roasted rose petals and ⅓ of the fried onion and1/3 of the fried Cashew nut and grind into a coarse mixture. Take the mixture along with 8 Cups of water and ½ Tsp. of salt in a pressure cooker and cook on low flame with the weight on for 20 minutes. Switch the flame off and wait till the pressure drops to open the Cooker. Now Transfer the mashed mutton to the cooker containing Lentil mixture and cook on low flame for 2 hours. You may add little water in between. Stir in every 10 minutes. Once done, add rest of the Ghee and cook for 5 more minutes. 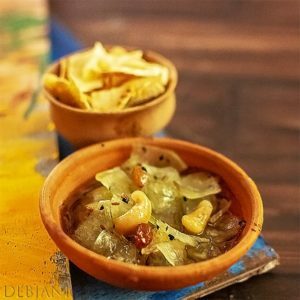 Top Hyderabadi Haleem with Fried Onion, Fried Cashew Nuts, and Lemon Juice and serve hot. If using barley, reduce 2 Tbsp. of rice and substitute it with Barley. I have used broken wheat instead of whole wheat. The more the slow cooking, the more the chance of getting the desired texture. You may increase or decrease the portion of pulses, however, the ratio I have given provides perfect texture. Increase or decrease Green Chillies as per taste. You may decrease the amount of Ghee or substitute with Oil. However, Ghee is required not only for the flavor but for the texture as well. Instead of roasting fresh rose petals, you may use dried rose petals available in the market. Don't add Lemon juice while cooking. It is better to top the Haleem with lemon juice and crisp onion & fried Cashew nuts at the time of serving it. Some people prefer to have Haleem with Mint leaves as well. However, I don't like to top my Haleem with mint leaves. 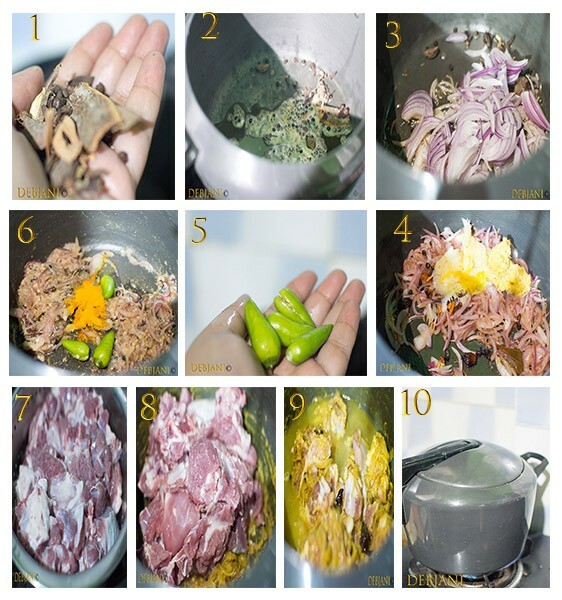 You may store Haleem in the refrigerator for more than 7 days. In fact, Left-over Haleem tastes heavenly! 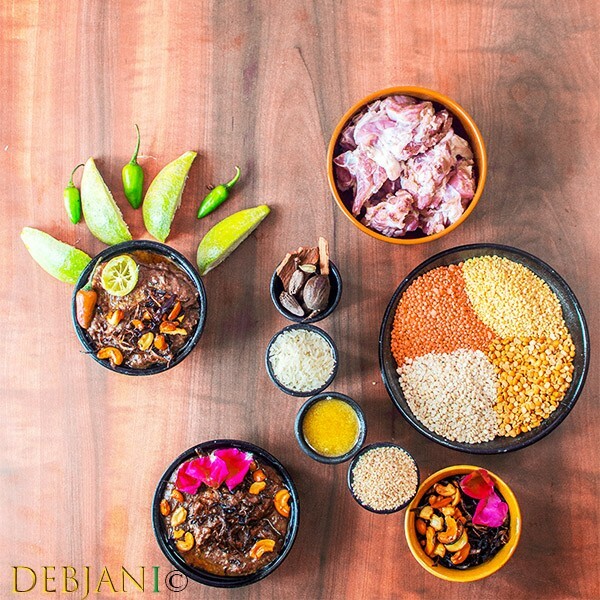 Have you tried the Hyderabadi Haleem Recipe from Debjanir Rannaghar!